Will Weldon shoots on goal for Peterborough Phantoms against Manchester Phoenix. Photo: Alan Storer. An hour of heart-attack hockey ended with two much-needed English Premier League points, but as many questions as answers for Peterborough Phantoms last night (January 17). A game that ultimately ended in celebrations following a 7-6 success against struggling Manchester Phoenix at Planet Ice came complete with far too many palpitations and self-imposed capitulations. Darius Pliskauskas in action for Peterborough Phantoms against Manchester Phoenix. Photo: Alan Storer. Phantoms certainly proved they are still capable of scoring goals with imports Milan Baranyk and Darius Pliskauskas making welcome - and, in the case of the former, match-winning - contributions to a bumper haul as they snapped lengthy personal droughts. But the city team also highlighted the fact they have become rather too generous when it comes to conceding them with Phoenix ruthlessly unwrapping a series of gifts. This could quite easily have been a seventh defeat, rather than a second win, in the past eight league games. Indeed were short-benched Manchester, who could only name 12 skaters, blessed with more quantity to back up the obvious quality of their import forwards, that would probably have been the case. Back-to-form Milan Baranyk in action for Peterborough Phantoms against Manchester Phoenix. Photo: Alan Storer. 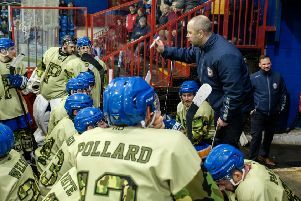 But, according to Phantoms coach Slava Koulikov, it was a night to concentrate on the positives rather than the negatives. He said: “It was probably a lot more entertaining for the fans than it was for the coaches, but I’m just happy to get the two points. “It was a night where the win was more important than anything else after being on a tough run lately. “It was important we got it and it was also nice to see a couple of other results go our way. “We performed well in spells of the game and showed great spirit to fight back from being behind early on. It was a frantic affair from start to finish last night with top-scorer Ales Padelek lighting the lamp for the first of 13 occasions, but Phantoms soon found themselves trailing to a rapid Phoenix scoring salvo. Michael Satek darted inside to level and converted a Robin Kovar pass to ease the visitors ahead on a powerplay before Martin Baranek bundled home a James Archer rebound all in under four minutes of action. Phantoms quickly ate into their arrears as Baranyk put away a Craig Scott pass to register his first goal in nine games and the same two players combined again to restore parity with the first of six goals scored in the second session. The remaining five all arrived in a crazy three-minutes-and-45-seconds spell as defensive play became non-existent. Phantoms edged ahead on three occasions courtesy of a smart Brad Moore finish, a long-awaited Pliskauskas powerplay tap-in as he broke a 10-game run without a goal, and a Lloyd Gibson effort. But Phoenix twice hit back with replies of their own as James Archer raced clear to tuck the puck past Janis Auzins short-handed and Kovar was perfectly placed to convert after a Satek shot had crashed back off the plexi-glass behind the goal. Manchester again clawed their way back onto level terms in the final period as Archer bundled in from close range and Phantoms’ appeals fell on dear ears after Auzins had been left on the deck. But they needn’t have worried as Baranyk became their match-winner when completing his treble by firing in a Scott Robson pass with just under five-and-half minutes remaining. And, despite plenty of incident at either end, that proved to be the final dish in a feast of goals. Phantoms remain third in an EPL table becoming more congested by the week. The top six teams are now covered by just nine points with leaders Basingstoke set to host in-form second-placed side, Milton Keynes, on Friday (January 22). Before then, MK visit Planet Ice on Wednesday (January 20) for the second leg of an EPL Cup semi-final which is finely poised following a 3-3 deadlock in the opening leg last week. Phantoms then resume league action when hosting struggling Bracknell on Saturday (January 23, 7pm) ahead of a Sunday (January 24) visit to reigning champions Telford.